Everyone has been trying to post or blog about 3 things they are grateful for, 100 Days of Happiness, or taking Positivity Challenges. Naturally, I found myself wanting to do one. So I sat down at my computer and eagerly began to list all the things I was grateful for – but alas! I could think of nothing. It surely wasn’t because I am not grateful for all of my blessings. It was because I wanted each one of my reasons to have “meaning” and “purpose” behind them. I opted to come back to the computer at another time. BUT as with everything in my life – things took precedence – my health, my family, back to school – and I neglected to compile a list of things I was grateful for. That was – until ….. I began to notice that there were lots of things I was grateful for. There were also lots of things I really, really, really liked. It was then I noticed – that I began to have lots of “favorite things” whether material or emotional that I took enjoyment in – that I was grateful for. Silly things, ordinary things, small things and extraordinary things …. I began to add those “things” to the list of obvious things: my family, my home, my pets, my faith …. and realized …. that I couldn’t just contain the things I was grateful for – in just ONE post/blog. 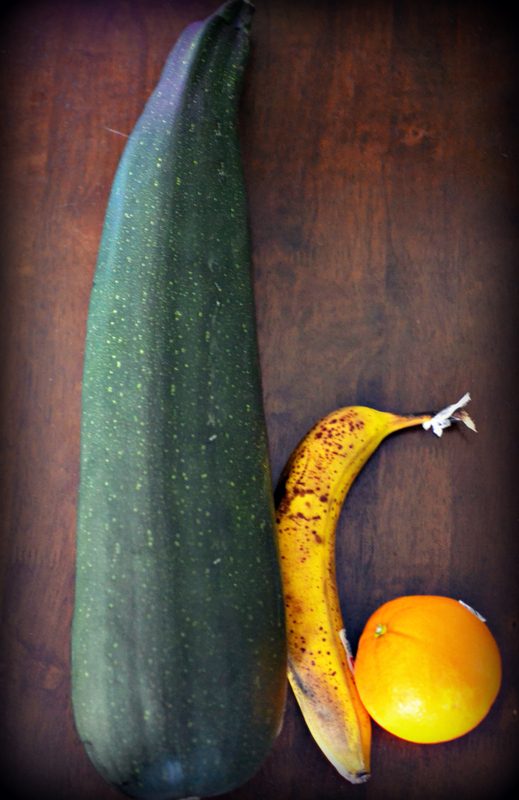 My absurdly large zucchini …. and to think …. I grew them from seeds and didn’t even fertilize them. Sorry the picture is a bit blurry. I took it in a rush – so I could cook this bad boy up! 🙂 I was able to make a Tomato, Zucchini and Corn Bake AND a Chocolate Zucchini Cake. Nature is so amazing. You had to go with the Large Zucchini first!! !